Did you have a happy Halloween? We certainly did. We went trick-or-treating for about an hour, it got pretty chilly outside, then came back home and handed out candy while the kiddos did “inventory”. Sorry for the cruddy photo -it was already dark out when we were ready to go. This year we have Spiderman, the Woodmen Tower, a pink flamingo, and baby skeleton. Everyone but Felix picked out their costume. I noticed that people in my neighborhood were handing out lots of non-candy items.Â Pretzels, popcorn balls, fruit snacks, Ramen Noodles, Pop-tarts, juice boxes, Little Debbie’s, Cheezits, Rice Krispy treats, and breakfast cereal are all the non-candy items my kiddos received trick-or-treating. You won’t believe which non-candy item my kiddos were most excited about. RAMEN NOODLES. Yup they were dancing for joy over a package of Ramen Noodles. This food blogging mama found that hilarious. Sasha, my creative artist, wanted to be a building for Halloween. We came up with the Woodmen Tower since it is an iconic building in downtown Omaha. Her costume was a hit. In fact she received extra pieces of candy everywhere we went. At one point she said “I think I will be this next year too.” Ha! Did you grow up in a town that had a shopping mall? My hometown did not have a shopping mall. If we wanted to go to the mall we had to take a thirty minute drive south to the “big city.” If we did have a mall, and if I would have hung out there after school, I would have totally stuffed my face with those buttery mall pretzels. You know what I am talking about. The fun part about writing recipes and posting them online is that I am constantly thinking about different recipes to try. Restaurant copycat recipes are fun category of recipes to make. And recipes that I can use in my daughters’ lunches are even better. Most days my daughters bring their own lunch to school. They seem to be happy to eat sandwiches every day but I want to give them something more than a sad sandwich. That’s where these pretzel dogs came in. What child, or adult for that matter, wouldn’t be delighted to open up their lunch pail to this fun lunch? This is a recipe where the kiddos can easily help. 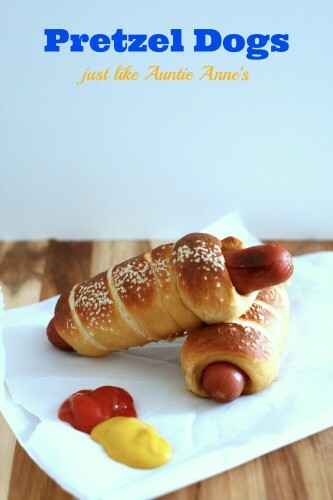 Let them roll out the pretzel dough and wrap around the hot dog. I have found that if I let them help they are even more likely to gobble it up. Sous chefs and clean plates are a good thing in my book. These were a hit in the lunch box but I also think they would make a great snack for tailgating or football watching. Beer + pretzels were made for each other. Cheers! Working in batches, drop 3-4 pretzel dogs in the boil water at a time, boil for 30 seconds. Remove to prepared baking sheet. Brush each pretzel with the egg wash. Sprinkle with kosher salt. Tofu pups would be great in these! Great job on the pretzel dogs and the costumes! We didn’t have a mall in our hometown either. We had 3 bars instead. We did have one about 20 miles away though. 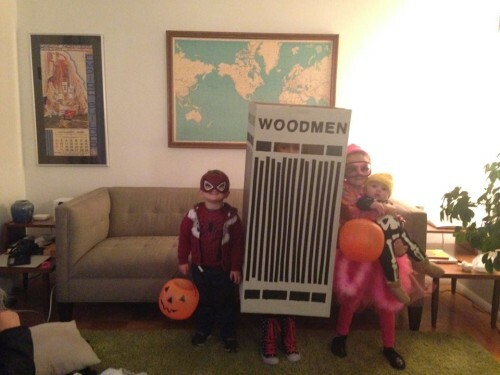 I LOVE the Woodmen costume! So creative! Auntie Anne’s is so tempting I always enter on the opposite side of the mall so I don’t have to walk directly past it. Awesome building costume!! So unique! 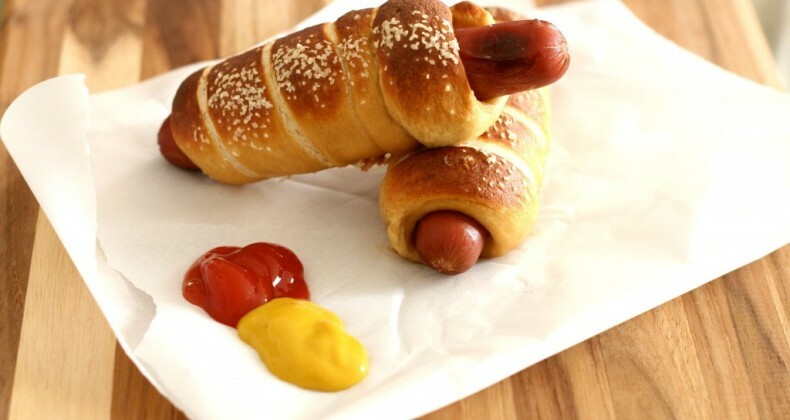 Pretzel dogs would of been a hit with my kids….probably still would be!!! Thanks! She is a silly girl. It was a fun challenge! 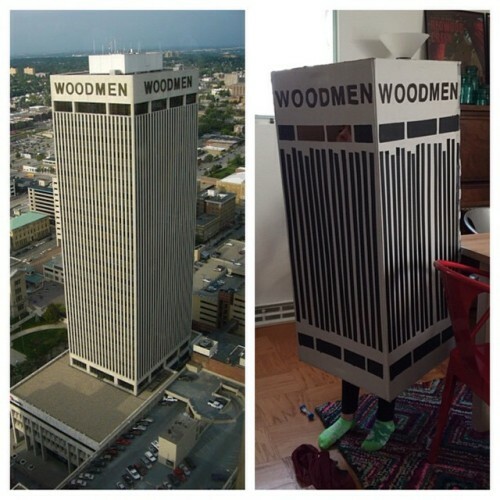 Love the Woodmen building costume! 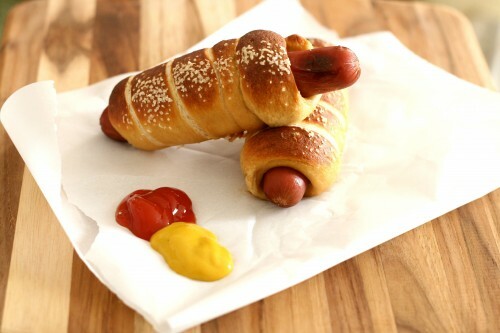 These pretzel dogs would disappear around our house. Looks like we have a project to do! A piece of furniture I love it! I am not sure where these kiddos come up with their ideas! 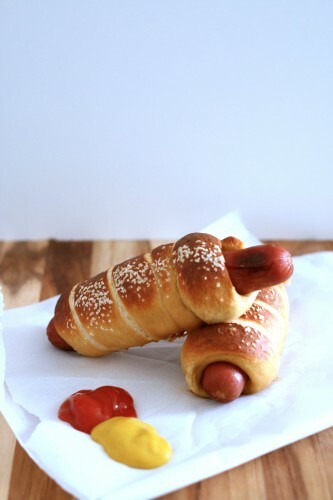 Girl, pretzel dogs from Auntie Ann’s are one of my guilty pleasures, I love those things! I’m excited to have your recipe to make them at home. 🙂 Pinning to our Saturday Night Fever board, thank you for linking up with us! Thanks Ashlyn! It is fun being able to make them at home.